Keeper Zachariah Mutai attends to Fatu, one of only two female northern white rhinos left in the world, in the pen where she is kept for observation, at the Ol Pejeta Conservancy in Laikipia county in Kenya Friday, March 2, 2018. The health of the world’s last male northern white rhino, Sudan, is rapidly declining, bringing the subspecies’ inevitable extinction closer to a reality. Even as scientists and conservationists work on an ambitious in vitro fertilization effort, there’s little reason for hope that the 45-year-old Sudan and his two female companions—the last of the entire subspecies—will leave any offspring behind. Sudan, who is aging and suffering from a leg infection, could soon be euthanized if his condition doesn’t take a turn for the better. Until recently, the subspecies numbered in the thousands across central Africa. However decades of poaching and habitat destruction leave only Sudan, his daughter Najin, and granddaughter Fatu. As of Tuesday, Sudan’s condition had improved slightly according to the BBC, although his caretakers say the prognosis is still “not looking bright” and they are not holding out “big hopes” for a miracle recovery. Whether Sudan meets his fate this week or next year, it will be a sad ending to a depressing story. What remains to be written is whether breeding advances, conservation measures, and reduced rhino horn demand will be enough to save the remaining rhino subspecies, numbering around 30,000 in total in the wild. 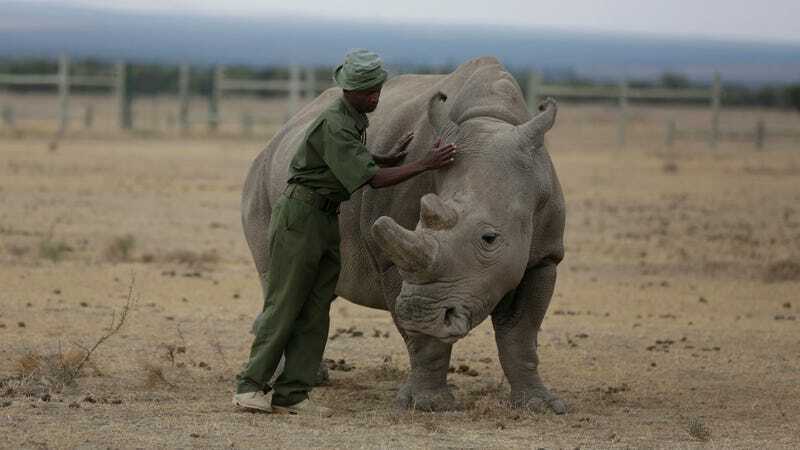 A ranger takes care of Sudan, the world’s last male northern white rhino, at the Ol Pejeta Conservancy in May 2017. Advanced reproductive techniques could eventually help other rhino subspecies in peril, according to Ford, including the Sumatran or Javan rhino, both of which number fewer than 100 individuals. However, there is no “cure” for extinction—prevention is the only proven method. “People need to back projects protecting critically endangered species so lessons learned can be put into practice with other rhino species, making sure they don’t dip below 20 individuals, that habitat is secured, governments, zoos and international actors cooperate, and breeding is intensively managed,” she said. As far back to the colonial era in Africa, rhinos were suffering due to mass hunting, and losing habitat to agriculture, livestock, and plantations. In the 1970s, poaching took off, causing northern white rhinos to go extinct across much of their range, including Sudan and Chad. In 2009, four Northern white rhinos were relocated to Kenya’s Ol Pejeta Conservancy from Dvur Kralove Zoo in the hope that their new surroundings, and other rhino companions, would stimulate natural breeding efforts. Nearly a decade later, it’s clear they won’t. Huijbregts is referring to China and Vietnam, where rhino horn is coveted for its purported medicinal qualities, and as a carved ornament connoting a prestigious status. Huijbregts said demand in China began escalating in the nineties in tandem with booming economic growth, and although legal trade was outlawed in 1993, illegal trade continues. Vietnam’s demand for rhino horn has skyrocketed more recently along with the country’s growth, and now its demand for the horn outpaces China’s. Just over 100 years ago, half a million rhinos roamed across Africa and Asia. Today, as few as 29,000 live in the wild, according to WWF, and three of the five remaining species are “critically endangered,” according to the IUCN Red List of Threatened Species. Still, against all odds, conservation success is possible, and has been achieved with black rhino populations in sub-Saharan Africa. After numbering under 2,500 two decades ago, they have since more than doubled to over 5,000 thanks to conservation and anti-poaching efforts, according to WWF. The Southern White Rhino has made an even more miraculous recovery, coming back from the brink of extinction to number around 20,000 thanks to strong protections and breeding programs. Today, it’s the least-endangered rhino subspecies. Huijbregts said aside from curbing demand for rhino horn, more rhino habitat must be protected, including connected corridors between larger protected areas. With Africa’s human population projected to double to 2.4 billion people by mid-century, rhino habitat is shrinking.